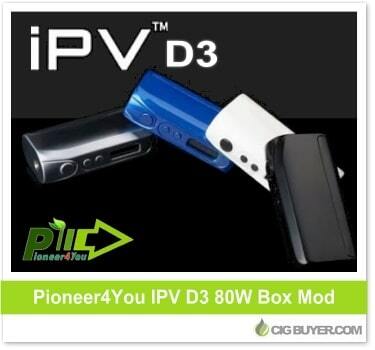 A follow-up to the popular IPV D2, the Pioneer4You IPV D3 Box Mod offers a bit more power (up to 80W) with the latest YIHI SX130H-V2 chipset. Not only can it be operated in wattage or joules, but it’s said to be one of the most accurate temperature control devices to date, with a range of 212°F-572°F and firing as low as 0.1 ohms with nickel or titanium coils. They added a magnetic battery cover to the IPV D3, voltage step down, and word is the finish is much more rugged and less likely to chip than the previous version.